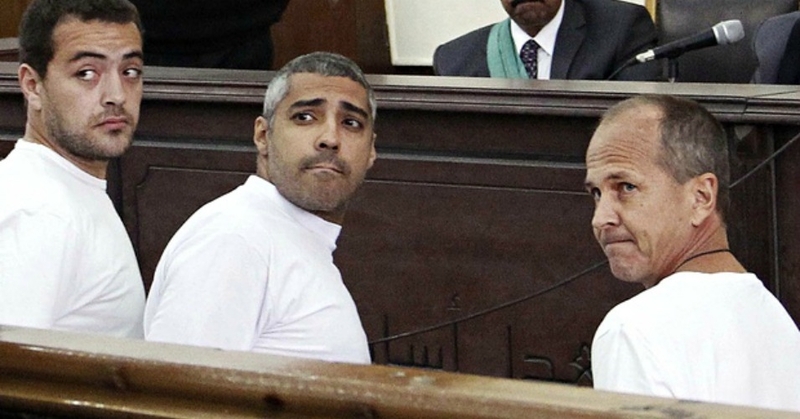 Baher Mohamed, Mohammed Fahmy and Peter Greste in court in Cairo in March. Photograph: Heba El-kholy, El Shorouk/AP. In a slightly positive but mostly disappointing development to their families and advocates of press freedom around the world, three journalists detained by the Egyptian government for more than a year were granted a retrial by an appeals court on New Years Day but will remained in prison until that trial takes places sometime later this year. After more than a year in jail, Canadian-Egyptian Mohamed Fahmy, Australian Peter Greste and Egyptian Baher Mohamed now face several further months behind bars, with no date for a new hearing set. Fahmy and Greste could still be deported under the terms of a recent presidential decree that allows foreign nationals to serve sentences in their home countries, but President Abdel Fattah el-Sisi’s office did not respond to a request for comment about his intentions. The hearing spanned two sessions that lasted for a total of less than 30 minutes, with both the defendants and reporters barred from entry. Defence lawyers were given just minutes to explain their clients’ innocence, with one calling the prosecution’s evidence “laughable”. After the verdict, the families and lawyers of the detainees reacted with disappointment, having earlier expressed hope of a conditional release. Meanwhile, Amnesty International reacted to the verdict with scorn. According to Amnesty’s estimate, at least 16,000 people have been detained as part of a sweeping crackdown on dissent in Egypt since the overthrow of the democratically-elected government in 2013. Egyptians activists inside the country say the true figure is much higher. Journalists perceived by the government to be a threat have been a consistent target and the prosecution of the Al-Jazeera journalists became a rallying cry for press freedom advocates throughout 2014. “We urge the judicial authorities to dismiss all the charges and acquit the Al-Jazeera journalists at the new trial,” said Lucie Morillon, program director for Reporters Without Borders, in response to the retrial announcement. Reporters Without Borders used the occasion to also call for the release of the 13 other journalists detained in Egypt, which it said now ranks fourth among nations who imprison journalists for simply doing their job. The nations ranked higher include China, Eritrea and Iran.